At almost any particle physics conference, meeting, or lunch table, the phrase "physics beyond the Standard Model" is heard over and over again. What's wrong with the Standard Model, anyway? Why are physicists so sure that there is something beyond it? And why do they think they can find it anytime soon? At almost any particle physics conference, meeting, or lunch table, the phrase "physics beyond the Standard Model is heard over and over again. Whats wrong with the Standard Model, anyway? Why are physicists so sure that there is something beyond it? And why do they think they can find it anytime soon? Particle physics strives to identify the building blocks of matter and describe the interactions that bind them: the set of instructions needed to create a universe. Our most succinct and (we believe) accurate set of instructions is encapsulated in a quantum field theory called the Standard Model, which describes a universe made up of six types of quarks and six types of leptons, bound together by three fundamental forces: strong, weak, and electromagnetic. While this model is known to be incomplete  it ignores gravity because it is so very weak  it successfully describes almost all the data from close to twenty years of experimentation at particle accelerators. Why, then, do physicists expend so much effort searching for what they call physics beyond the Standard Model  by which they mean new particles and forces outside this framework? Hasnt the Standard Model stood the test of time and been verified? In one sense, yes: it provides a precise framework for calculation, and one whose results match experimental data exquisitely well. That exquisite match occurs, however, only if we add an additional particle to the quarks and leptons. Without it, the Standard Model ends up predicting probabilities greater than one  more likely than a certainty, a nonsensical result. It is as if we were trying to calculate the angle at which a ball will bounce off a wall and found instead that the theory predicts an infinite number of balls bouncing back at us: it goes mathematically crazy. This situation is similar to the ultraviolet catastrophe in classical physics at the end of the 19th century, when theory predicted infinite probabilities for radiating high-energy light waves. Back then, the catastrophe pointed the way toward quantum mechanics. Today, the infinities in the Standard Model point toward a missing ingredient, a particle unlike the others and that is named for its inventor  the Higgs boson. No one has ever seen a Higgs boson, and until we can make some of them in our accelerators and study them, we cannot be sure that this ingredient is really present in the universe, or at least present in the very simple form in which its written in the Standard Model. We can already be sure that, Higgs or not, there is something out there that plays its role: its indirect effects are already detectable. Quantum effects connect the mass of the W boson to those of the quarks; since the top quark has a very large mass, it has a detectable impact on the W. The magnitude of this impact depends on the Higgs. In fact, the W mass is found to be shifted upwards in exactly the way expected from the effects of a Higgs; if there were no Higgs, the Ws mass should be significantly lower than what we measure. So the Standard Model plus the Higgs would be a complete theory, then? Yes and no. Mathematically it would be self-consistent, but not elegant  quantum mechanical effects would naturally tend to make the mass of the Higgs extremely large, while our best (indirect) evidence is that it is not; in fact, it may lie just beyond the reach of our most recent experiments. More importantly, the Standard Model contains no particles with the right properties to form the dark matter that seems to pervade the cosmos. There are rather strong arguments, based on astronomical observations and cosmology, that this dark matter is made out of particlesbut not out of any of the Standard Model ones. The interesting implication is that the Standard Model is indeed a beautiful description, but a description of just five percent of the universe (the fraction made up of quarks and leptons). One commonly proposed idea that addresses both of these issues is to embed the Standard Model inside a larger theory, supersymmetry. Supersymmetry is mathematically elegant and solves the Higgs mass issue. If supersymmetry proves true, then for every type of familiar particle there would be a new species of superparticle, with analogous properties but much more mass. The lightest superparticles would be stable, and large numbers of them would still be drifting through our universe  left over from the big bang, when particles and superparticles were presumably created in equal numbers. These leftover massive particles would then naturally form the dark matter. 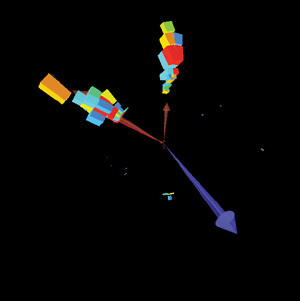 A computer reconstruction of the particles produced in a single collision in the Tevatron, recorded by the DZero detector in 2003. This is the highest energy event found in one of the supersymmetry searches. It has two energetic jets of particles (top and left) recoiling against “nothing” (the blue arrow which shows the reconstructed missing momentum). An excess of events like this would be a signal for the production of supersymmetric versions of quarks or gluons. The only way to settle questions like this one is through experiment. We do not know whether there is a simple Higgs or something much more complicated. We cannot tell from cosmology whether the dark matter is made out of supersymmetric particles or not. We cannot theorize or compute our way to an answer: we must inquire directly of nature, using accelerators. By colliding particles together at very high energies, we concentrate a great deal of energy at a single point in space. This allows nature to tell us what she contains. We can bring to life all these kinds of particles and forces that are innate in the equations describing the universe, but that we dont see in our everyday world. There is a very tantalizing aspect to all this. It is not that we can be certain of physics beyond the Standard Model: that much is already clear, since the Standard Model doesnt incorporate gravity or explain the masses of neutrinos. What is tantalizing is the certainty that this physics beyond the Standard Model is very close  around the next bend in the road. The energies that we can explore in accelerators allow us to create particles of just the masses that we expect superparticles to have. Our accelerators match the energy scale of the Higgs field, regardless of what it is made of, and they also match the mass that we expect for the components of dark matter, based on rather general arguments from cosmology. This experimental program is underway, right now, at Fermilab. Run II of the Tevatron offers a real possibility of discovering physics beyond the Standard Model. At the summer 2004 international conferences, we in the DZero experiment presented new, very sensitive searches for the production of superparticles. We have searched for both supersymmetric quarks and gluons, which would show up as events with high energy jets; and for supersymmetric relatives of the W and Z particles, which would show up in our detector as an unexpectedly high rate of electron, muon and tau lepton production. In either case, we would also expect a significant imbalance in the momentum seen in the detector, which is shown in by the blue arrow. We would see the imbalance because the unstable, massive superparticles would decay, and one of their decay products would be the neutral, invisible lightest superparticle: the dark matter. (If this is actually happening, then the Tevatron is adding a very small amount of extra dark matter to the universe  but dont worry, there is so much out there already that this wont make any difference.) Our colleagues in the CDF experiment are carrying out a similar program of analyses. Neither experiment has yet seen any clear indication of new particles, but the searches are just starting to explore the most interesting regime, and the physicists carrying out these studies are excited: the Tevatron is performing well, and delivering lots of data. More data means increased sensitivity and the ability to explore further. The Tevatron will operate until at least 2009 and stands a very good chance of making a discovery that would revolutionize particle physics. A very good chance represents good odds, but it is not a guarantee: nature may have set the masses of these particles a bit higher than seems natural to us, or may have made their effects cancel in odd ways. Theres not much we can do about that kind of capriciousness at the Tevatron, but in the slightly longer run we can be sure that even such tricks wont escape detection. The Large Hadron Collider (LHC), now under construction at CERN in Switzerland, will have sufficient brute force in its collision energy that it will certainly knock down the door to this new domain of physics beyond the Standard Model. We dont know what we will find once we open that door. Most likely, something strange and interesting will show up in our detectors, far different from our simple models of a Higgs particle and supersymmetry. There are even serious suggestions that new dimensions of space may open up. Whatever it is, a whole world of new particles and interactions awaits exploration. The sooner we can glimpse that world, the sooner we can start planning how to explore it in detail, which will most likely involve constructing a new, high energy electron-positron collider capable of precise measurements of all these new particles and their properties. To summarize, then, we have a very detailed knowledge of how the Standard Model particles interact, but we know that this knowledge is incomplete: it describes a mere five percent of the universe. We know the approximate energy scale where new particles  including, we believe, the components of cosmic dark matter  are to be found. The Tevatron collider has a good chance of reaching that energy scale, which gives us great excitement about what we may be able to find between now and 2009. Whatever we uncover, it will pave the way for an exciting decade, exploring this new world of new particles and forces, both at the LHC and at a new electron-positron International Linear Collider  and it will start to give us an understanding of the other ninety-five percent of the universe. John Womersley is scientific advisor to the Department of Energys Associate Director for High Energy Physics, based in Washington, DC. He is on a two-year leave of absence from Fermilabs DZero experiment, to which he plans to return and continue his quest for physics beyond the Standard Model.